Directions: Mix each serving (1 scoop) of Cellucor Alpha Amino in 8-12 fl oz. of cold water or other beverage of choice daily. DO NOT EXCEED 4 SERVINGS PER DAY. USE ONLY AS DIRECTED. Settling may occur. WARNING: THIS PRODUCT IS ONLY INTENDED TO BE CONSUMED BY HEALTHY ADULTS 18 YEARS OF AGE OR OLDER. Do not use this product if you are pregnant, nursing, or are currently taking nitrates for chest pain or if you are taking medication used to treat erectile dysfunction such as PDE-5 inhibitors. Before using this product, consult with a licensed, qualified health care professional, including but not limited to, if you suspect you have or have been treated for, diagnosed with or have a family history of any medical condition, or if your are using any prescription or over the counter medication. Immediately discontinue use and contact a medical doctor if you experience any adverse reaction to this product. Discontinue use 2 weeks prior to surgery. Do not exceed recommendations for Suggested Use. Use only as directed. Do not use if safety seal is broken or missing. Store in a cool, dry place. KEEP OUT OF REACH OF CHILDREN. 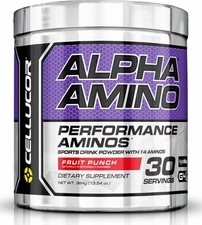 Cellucor Alpha Amino is not a food or beverage. NOTE: Cellucor Alpha Amino does not contain aspartame. The phenylketonurics notice is intended for people with the genetic disorder, phenylketonuria. © 2018 GotProtein.com All Rights Reserved.